Sidebars and Widgets go hand-in-hand because they generally require each other to make it work. Without sidebars, you cannot show any widgets, and without widgets, your sidebars will be empty on the front of your website. Widgets are available by going to Appearance > Widgets. The big panel on the left side shows all available widgets. The small panels on the right are the widgetized areas. To add a widget: drag and drop the widget from the left panel to the right panel. You can see in the screenshot above that the “Sidebar” position currently has 4 widgets added. To remove the widget: drag the widget back to the left panel. If you want to keep the widget setting for future use, drag it to the Inactive Widgets instead of the Available Widgets panel. Widgets will also be placed there if you switch to a different theme. Because this information is stored in the database, when switching back, your widgets will go back into their original sidebar positions. If you are temporarily holding a widget in the inactive area and you want to retrieve the widget, drag the widget from Inactive Widgets panel instead of the Available Widgets panel to the sidebar position of choice. 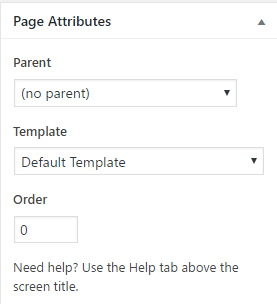 There is another way to add widgets to your sidebars and website, but although it’s a small area to properly manage, the WordPress customizer has a setting to add widgets….although we recommend managing your widgets from the main Admin area. Choose the sidebar position where you want to add or remove a widget. Click on “Add a Widget” button. A list of available widgets will appear, now select the desired widget. Title your widget and perform any other settings (depends on the widget you are using). Dynamic width sidebars/widgets is something we provide in our premium themes. Normally, a sidebar is a single block area that stays as a fixed area. So for example, if you have two (2) sidebars side-by-side and publish one (1) widget to the first sidebar, your second sidebar is going to show an empty space. That does not look very nice. Dynamic width sidebars are different in a sense that if we take our example above, the single widget published will automatically resize itself to fill the empty sidebar position to the right of it, giving you one full width widget. You may have noticed there are many ways to edit your website and the theme you are using. We’ve talked about using the Additional CSS feature in the customizer, using a child theme, and also using the WordPress Theme Editor. 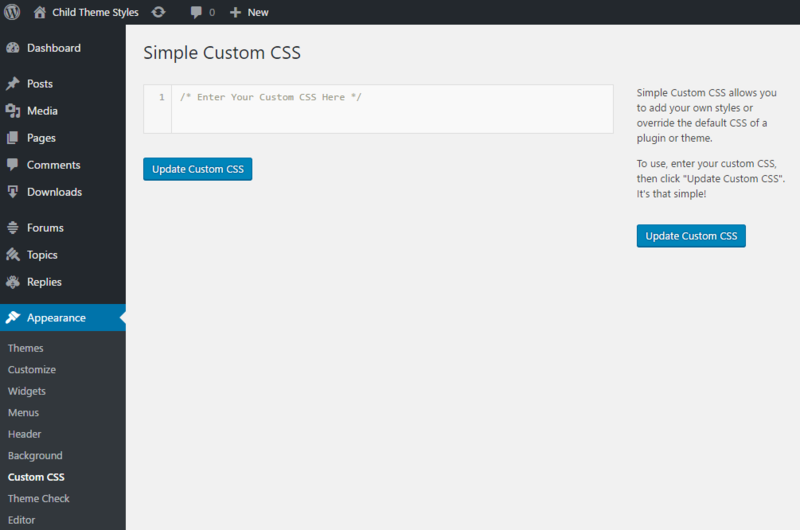 We still have another option to allow customizing your theme with only CSS changes. Remember from the Additional CSS tutorial, we talked about the limited space you get to work in, but with the plugin method, you get a lot more real estate to work with. There are a few custom CSS plugins out there, but the one we recommend is called Simple Custom CSS which was listed in our Introduction to Plugins and Recommendations. This will guide you through the setup of the Simple Custom CSS plugin. Once installed, it adds a link to the Appearance menu labeled as “Custom CSS“. To start adding your own CSS code, either remove the /* Enter Your Custom CSS Here */ comment line, or add your code on the next line below. 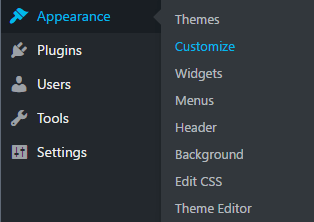 If you are using a child theme and need to edit any of the files, including the styles, you can do it directly in the Theme Editor that is found under the Appearance dashboard menu group. To make it easier and better managed, I use the plugin WP Editor for this website. It enhances your editing experience much better than the default WordPress version. 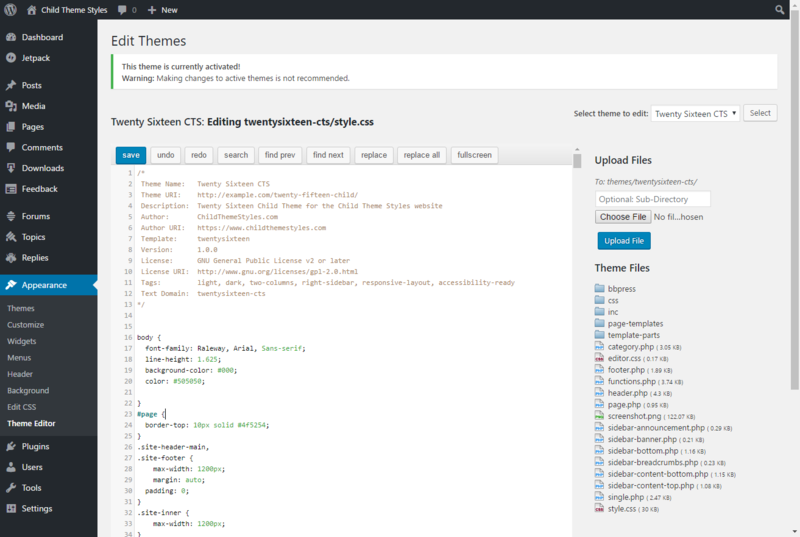 From this screen, you can now view and edit your child theme style.css file. You can also navigate to other files in your child theme (see the right side column) to open and edit as well. You can read more detail from the WordPress site for Editing Files. IMPORTANT: Before you start editing any file, regardless if it’s the child theme, parent theme, or other, ALWAYS create a backup first whether it’s simply copying the files or using a Backup plugin (recommended). There are times when you need to make changes to your theme that requires modifying theme files. If you were to modify a theme file and an update comes along, you will lose your changes because the update overwrites the theme files. You can refer to the WordPress Child Themes for the full details of creating your own child theme. Will You be Making Changes? One thing to consider whenever you are setting up a website, or even if you have an existing website on WordPress, is whether or not you plan to make custom changes. Even if you are not 100% sure right now, it’s something you may do later in time, so I recommend that you give this some serious thought. Whenever you decide to use a child theme, it means you have to deactivate your theme and activate your child theme. WordPress will see this as a new activation, therefore, you may have to redo all your settings, options, and maybe even widgets. If your website is already established, styled, and many widgets are being used, this makes for a nasty time to put everything back in place and to redo all your option settings. If you start with a child theme with the possibility that you may customize your theme later in the future, I recommend you start with the child theme right away to avoid the hassles of going back and redoing everything later. Before you use a child theme, it’s important to ensure that you have the parent theme installed in your website. It does not have to be active, but it does need to be installed. The child theme will be the one that you activate. The reason for the need of a parent theme is so that the child theme can inherit the features and functions of the parent. This is important because a child theme is generally going to start out as a blank theme that is waiting for your custom modifications to be added to it. In a sense, because it inherits all the functions of the parent, you are simply adding new functions and styles. Child themes don’t get updated for the same reason why you do not modify parent themes. The purpose of the child theme is to override and customize the parent theme, so if you updated the child theme, guess what! You lose your custom changes. The only theme that gets updated is the parent theme, at which point the child theme will “inherit” the new update from the parent theme. If you NEED to update the child theme, you have to do it manually and only change what is required to update. NEVER do auto updates to a child theme, or upload the complete child theme without knowing what was changed. BACK-UPS! ALWAYS make back-ups of your theme and website. In situations where you need to modify a theme file (from the parent theme), you copy the file over to your child theme and then make your changes from there. Even if the parent theme gets updated, that file you copied won’t be affected because it exists in the child theme; only the parent theme file gets updated. If you are using a child theme and only make CSS changes, you can use the child theme’s own style.css file. 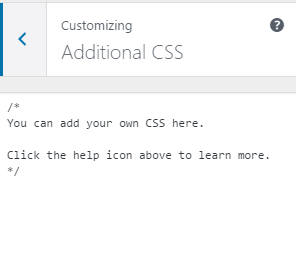 No need to use the Additional CSS in the customizer or a plugin. To help you customize your website, the WordPress Customizer is available with a variety of settings and options that are located within panels that you click on. If you see other panels included, they will be part of the theme you are using. Themes will offer additional options for your website and will show up along side with the default panels. Most settings are associated with basic form elements, so you will be able to recognize many of them. There may also be some custom options added that are specific to a theme. 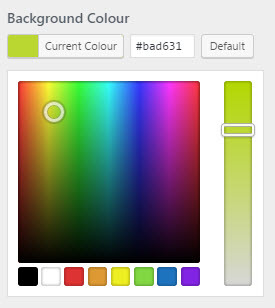 Currently, WordPress only has one type of colour selector that uses HEX colour values. People are still waiting for the implementation of an RGBA colour selector because it would offer a transparency setting too. Most themes will offer colour selectors to let you customize various elements within your website. Using a selector is quite easy because all you do is drag around a circular cursor and a slider bar to adjust the saturation level of a colour. In our screenshot below, you will see the HEX value #bad631 of the green currently selected.